Merry Christmas and I hope everyone is enjoying the holiday season! 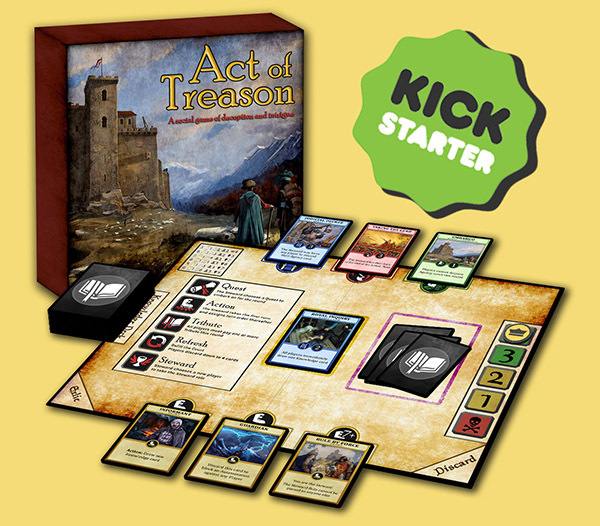 Only 43 days until Act of Treason is up on Kickstarter! I'm currently rushing, making sure all the i's are dotted and the t's are crossed. This week I'll be talking about the most recent Act of Treason review by Unfiltered Gamer, the website update, social media, and other sundry miscellaneous thingys. 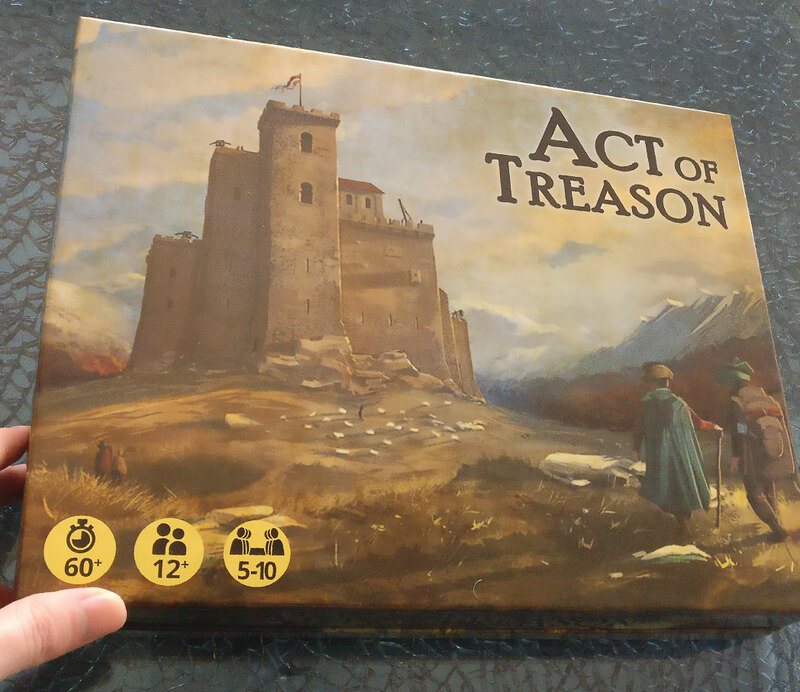 I'll start with the most awesome news - Unfiltered Gamer has reviewed Act of Treason, and from the sounds of it they really liked it! For those of you who don't know Unfiltered Gamer is an independent 3rd party board game reviewer. 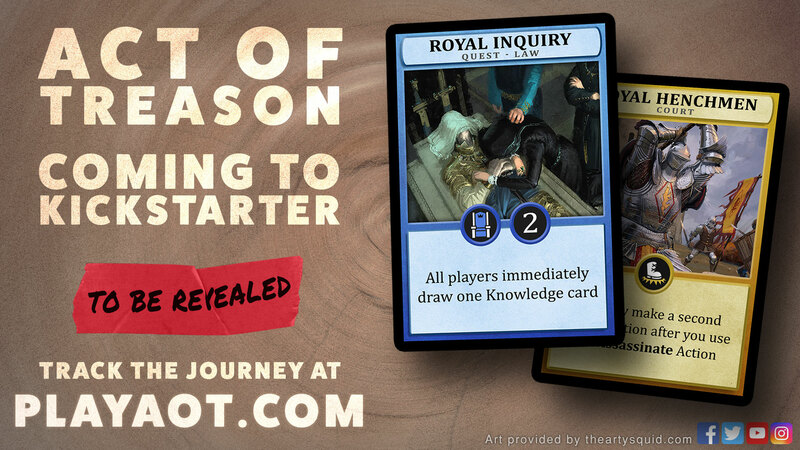 They often review games that are going up on Kickstarter to help people get to know if the game is for them. Overall I loved the review and I'm very happy with it. You can watch it below. In addition, Unfiltered Gamer will be doing a live play of Act of Treason on Wednesday the 17th of January PST. This is the best opportunity to check it out and see what AoT is all about before the launch date ! You can watch the livestream at the Unfiltered Gamers Facebook Page. Be sure to sign up so that you get notified when it's on! Featured the Unfiltered Gamer review on the front page as well as on the feedback page. 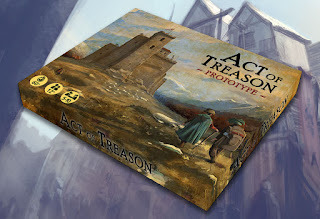 Revealed more rules for Act of Treason in the Rules section. A few other small tweaks and Quality of Life improvements here and there. I just wanted to say a big thank you to everyone who is signing up to the Kickstarter mailing list. I've already seen a notable increase to the number of subscribers there. It has more than doubled since the 8th of November, which I'm pretty ecstatic about, which brings us to a solid ~700 followers. We're well on our way folks! 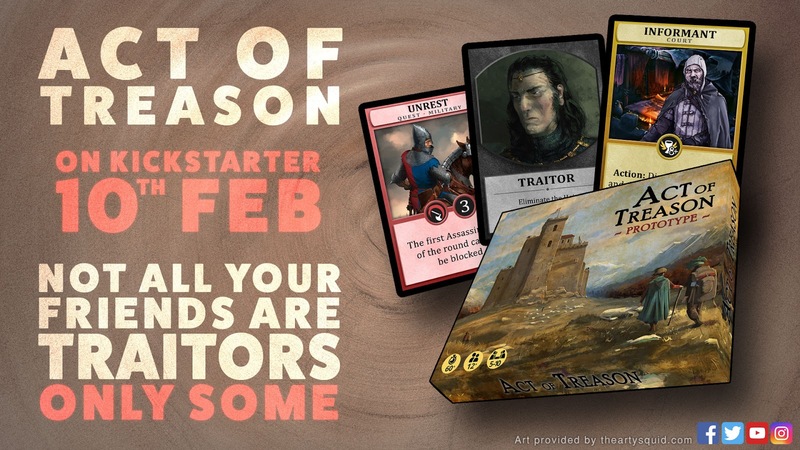 As some of you may know where currently running a promotion whereby if we get enough followers before the Kickstarter launch date on the 10th of Feb we'll be boosting the art/marketing budget. I think 4,000 followers may have been a bit high in hindsight, but it's still very much possible! If we can make a sizable dent in it then I'll definitely consider giving a small bonus as a reward even if we don't hit the 4k goal. I'll be working hard to make sure that we try to collectively hit the 4k goal! I want to be able to make the best product possible and 4k would make for a very stable foundation indeed. If you know any podcasters or 3rd party reviewers who might be interested in covering Act of Treason to help get the word out please do let me know in the comments or you can contact me directly. I'm not sure if I've shared it yet, but here is the final prototype all boxed up. The art is subject to change, and the components might be altered a bit, but at this stage the mechanics are all pretty much locked down. That's Emilien Rotivals artwork featured on the back an front of the box. Great artist, you can find more of his work over at theartysquid.com. For those of you who may have missed it, the first article of The Dominant Strategy is up. It's called 'What Makes Games Fun?' 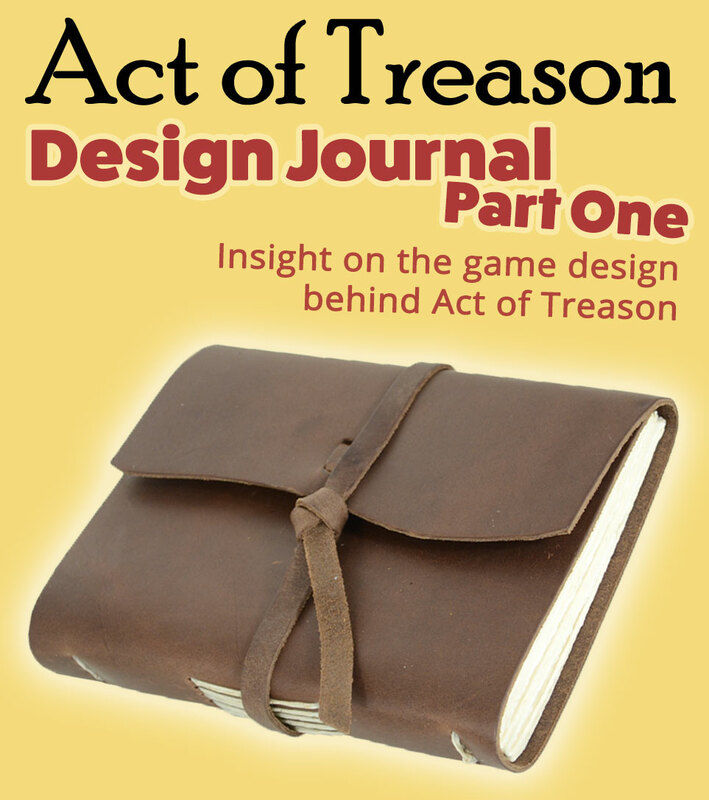 In it I explore the various reasons why we enjoy games and give some color to how a game designer might use this information to inform your design choices. If you're interested in game design, feel free to give it a read here. I think that about covers it for this week. Disclaimer: I have no formal training in game design and this article is my opinion. I always welcome any well reasoned, thoughtful critiques. Understanding what makes games fun is a very important part of making great games. If you don’t understand what makes your game fun, then you won’t know how to adjust your game in order to improve it. You won’t know what to prioritise when tweaking mechanics and what to alter in order to maximize your design goals. You must have an understanding of what you have and what you are working towards. If you don’t understand why your game is fun then you’ll be firing blind when it comes to trying to fix it. Before we get into the meat of the article I need to talk about what "Fun" means. Why? Because games are not always fun all the time. Some of the best games can be downright stressful or infuriating at times – take League of Legends, or Playerunknowns Battlegrounds (aka PUBG) or a really difficult game like Spelunky or Faster Than Light. Engaging yes. Enjoyable? ... It's not always apparent to the outside observer. A person playing one of these games will seem totally engrossed. Sometimes stressed. Can you really call that fun? Maybe if you're using a certain definition - but we don't want any ambiguity here - we want a term that accurately describes what it is that we should want in our games, and what we want to work towards. Perhaps a better term for describing what we want to work towards is Engagement? 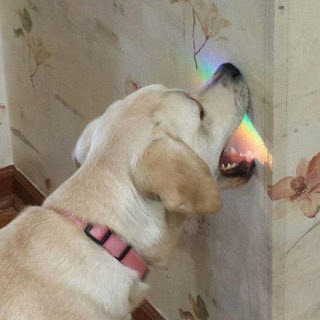 You'll notice that games almost always totally engross the player. The players are focused on what they are doing - it has their attention. However, there are some games that you can play and be quite detached, enjoying a movie or a TV show at the same time. For example, grinding for loot in Diablo III or Warframe. Sometimes you'll be engaged when playing these games. Sometimes playing these games is far more passive. What's interesting here is that, while you're grinding for loot, the game is less engaging and less enjoyable. So, now we can have games that aren't engaging and aren't enjoyable at some points... and yet still might be enticing enough that someone will want to play it? Why!? Well, because there is progress to be made in the game, and that progress is in itself Rewarding. Not only this, but the grind allows them to access content later in the game that would be Enjoyable and Engaging. The player is trudging through the more boring parts so that they can unlock the better parts. These unlocks are a big part of the attraction for some games, and just giving all the unlocks to the player for free ruins the fun of some of these games and significantly lowers the replayability. So we can see that Engagement, Enjoyment and Reward are all really good metrics in determining how much enjoyment you're having with a game and how likely it is that you'll keep playing it, or return to it later. If we make "fun" our design goal then we need to make clear what we mean by that, or we may mistakenly prioritize the wrong goals. 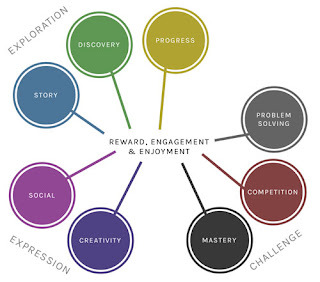 What we are trying to aim for is to maximize Reward, Engagement, and Enjoyment of the player. And while this is a fairly robust definition, it likely doesn't cover all of the smaller various ways in which we find games fun! Okay. Now that we have that out of the way and we understand what we need to maximize in our games... let's take an even deeper look into what makes games "Fun". Well, there are a few nebulous categories that can help us to understand where fun comes from. These are just a list of things that people find enjoyable, or rewarding, or engaging - nothing groundbreaking really. The groundbreaking part comes from understanding which of these are tapped into by your game - and then using that information to tweak your game as you design it to better take advantage of what people enjoy. Whether you know it or not, this is what you're doing when you're tweaking the mechanics of your game. You're trying to better tap into the pleasure nodes in people's brains, to make the game more enjoyable, rewarding and engaging for them. I will call each of these categories ‘Nodes’. These nodes are by no means strict in their definition, nor is this list of nodes definitive; this is why I used the term 'nebulous categories' before. 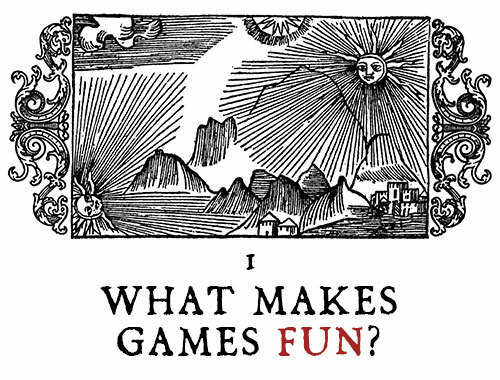 The above is merely a guide to help us understand where "Fun" might be derived from so that we may better cater our game to the enjoyment of the players. What are each of these Nodes? First let’s examine what each one of these Nodes is - what they mean and some examples. Something interesting to note is that if you don't hit any nodes, then there is almost no incentive to play the game as it would have nothing that we enjoy - for that is the purpose of the roadmap, to map out what we enjoy in games! By logical deduction there can only be two errors, either the roadmap doesn't include what people find enjoyable in your game, or your game isn't enjoyable! Creativity is just what you expect, so there isn’t much to say here. Creativity is being able to create something, not just having to follow a beaten path, or use existing tools for a set preordained purpose. You get to create something your way, your style. Some notable examples of games that tap into creativity: Minecraft, The Sims, Factorio, Sim City. This Node kinda ties to problem solving - after all, if there's more than one way to get to the solution, then there is an element of creativity. Balance in games helps to facilitate creativity - if choices aren't balanced for the players, then players are less likely to make creative choices, and are more likely to make overpowered choices that will improve their chances of winning. Thus it also follows that the less competitive a game is, the better it caters towards creativity. Progress is about achieving something, completing something, fulfilling a goal, leveling up a character, unlocking achievements, etc, etc. The Progress Node often goes hand in hand with the Discovery node as making progress often unlocks some new content within the game. Great examples of games that are high in progress are RPGs such as Diablo III, World Of Warcraft or Warframe. Progress in such games would be grinding for better gear or leveling up a new character to max level. Games heavy in grind or that have a ton of things to unlock are heavy in the Progress Node. Pong is a great example of a game with no Progress. There is nothing to unlock or achieve! In pong, you start with everything. Lots of games include a progress component because it's easy to do - but that doesn't always make the game better! For example, Adding unlockable perks to a game like PUBG might make the game have more for the progress node, but it would also lower the Competitive node as the game becomes less fair and balanced. Since the competitive node is the backbone of PUBG, it is highly likely that adding a account level up system or unlockable perks would be a negative to the play experience and draw important resources away from other valuable parts of the game that would yield better results. Discovery is uncovering something new and experiencing new content. Almost all games tap into this to some degree - after all, every single game is new to the player until they have played it. Once explored the Discovery Node loses its luster as you can only discover things once. Discovery ties in nicely with the Progress and Story Nodes as they all are likely to be joined together somewhat. Games with a lot of unique content to explore are heavy in the Discovery Node but games like spelunky tap into it too, by offering content to discover behind difficult but rewarding challenges. As mentioned examples are far reaching, but include: Half-life, F.E.A.R, Factorio, Spelunky, Metroid, The Walking Dead, Neverwinter Nights, etc. It may be better to talk about what games don't tap as much into the Discovery node. Notable games that tap minimally into Discovery include: Pong, Playerunknowns Battlegrounds, Killing Floor 2, etc. Games that can be described as “what you see is what you get” are prime contenders for low Discovery. Story or Narrative is the least “game” node out of all of them - after all, you can't play a narrative - but I have included it for completeness as it does contribute to what makes a game "fun". This Node is self explanatory. Story is typically a narrative that progresses throughout the game. Story is often tied to Progress and Discovery. A couple of Notable examples of games heavy in the Story Node are The Walking Dead and the Half-Life series. The story can be enjoyable in its own right, thus boosting the games appeal, or even completely dominating it. Story can also sit in the background and be safely ignored, such is the case of games like Spelunky, or PUBG. Competition mostly refers to the want to win and to dominate. A lot of games heavily utilize this node, and some almost ignore it entirely. Multiplayer PvP Games like Counter-strike, StarCraft II and PUBG being prime examples of games that capitalize heavily on this node, while some games like The Sims and The Walking dead safely ignore it. Single player games against AI or a tough objective also count as utilizing the Competition node. Cuphead, Spelunky, and FTL (Faster Than Light) all tap into our desire to challenge ourselves and to dominate a challenge. Social refers to the enjoyment that stems from interaction with other humans. You can build a game that heavily relies on social interaction such as Keep Calm and Nobody Explodes. Or you can simply have a game that allows you to socialize while you play. PUBG, for example, allows you to interact with either friends or randoms online whilst playing, giving you plenty of opportunity and subject matter to banter over as you loot and kill your way to that elusive chicken dinner (in PUBG, a win is called a chicken dinner). Enjoyment can be derived from this social experience and yet it can be completely detached from the mechanics of the game. In other words, the game can simply facilitate social interaction instead of tying it into the mechanics of the game and how it plays. 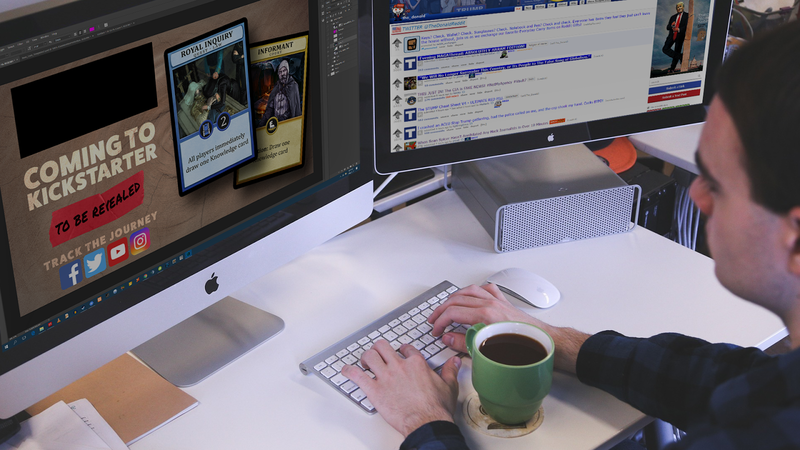 The social interaction is its own fun thing, but as a game designer you will have the option to use it in the mechanics of your game, and thus it pays to consider it. Problem Solving describes our want to solve puzzles and fix problems. It ties in to the competitive node as well as the progress node. Why? Because solving a problem is hard, rewarding and often results in us making progress. It doesn't just have to be puzzles however. Problem solving covers general strategy as well - any difficult decisions that require at least some consideration. eg: Choosing if you should loot a nearby corpse in PUBG and risk getting shot. PUBG is actually a great example of a first person shooter that has better tapped into the Problem Solving Node over its predecessors. Games like Factorio, Space Chem, and Battle Brothers are all great examples of games that scratch that problem solving itch quite nicely. Mastery is a node that almost didn't make the cut. It's a node that is highly similar to Competition and Progress in many ways. You could call this node competitive progress or progress of self. It describes wanting to get better and master the game, and the rewarding feeling that comes from this personal improvement. People are going to be more incentivized to master a game that is good, fair and balanced. Mastery will almost never be a Node that brings a new player in unless the player is highly motivated by being the best at games and is looking for that exact experience. Mastery is more likely to be a Node that convinces an intermediate, or an advanced player to stick around after the discovery node has started to wear off. You'll also notice I've tried to group each of these nodes under the three groupings of Challenge, Exploration, and Expression. Theses are quite lose groupings but, at a fairly broad level it does assist with breaking down what makes a game fun. Does the game offer the user a challenge? Does it allow for exploration? Does it allow for expression? If you answered yes to one or more of those, there is a good chance the game will be fun as long as it is at least somewhat balanced, and playable. Why do we enjoy these Nodes? Lets have a quick chat about these Nodes above, because I have an interesting theory about them. I believe we enjoy these nodes as they served a primal purpose back long ago as we were developing as a species. I believe all of the nodes stem from our base survival instincts. When hunting for food there is an element of challenge and problem solving involved - tracking, hunting, and killing. Besting your animal opponent, without getting yourself hurt, or taking too long, or wasting too many resources. There is an element in creativity when devising traps. New ways to hunt. New ways to farm. New ways to cook. New ways to convey information. Art allows us to convey information and express ourselves. Naturally there is competition, which stems not only from hunting, but from the male dominance instinct. We want to dominate our peers and come out top of the pack. This also explains why competitive games have far more male players. We enjoy winning, and being the best of our group. We like training ourselves to be better, so that we can improve. Socializing is important, not just to improve your chances of finding a mate, but also allows for better co-operation. You need to be able to foster trust and a cohesive bond among your peers, which greatly improves the chances of survival. Progression helps to reward us when we succeed and create. Building a well, or a hut is rewarding, and a form of progression that is useful. We feel great reward from accomplishment. I wouldn't be surprised at all if we get a kick out of all these things because they helped us to survive. Those who enjoyed these types of activities were more likely to partake in those activities and thus were more likely to survive. We enjoy games because in some way or form, games imitate life, albeit in a much more abstract way. We can learn from games. What is life but the world's most complex game? But what about things like art & balance? A quick note regarding graphics/art, balance, and polish. No doubt that graphics and art pay an important point to what makes a game great. A nice looking game will always be more appealing than a game that looks like trash warmed up. 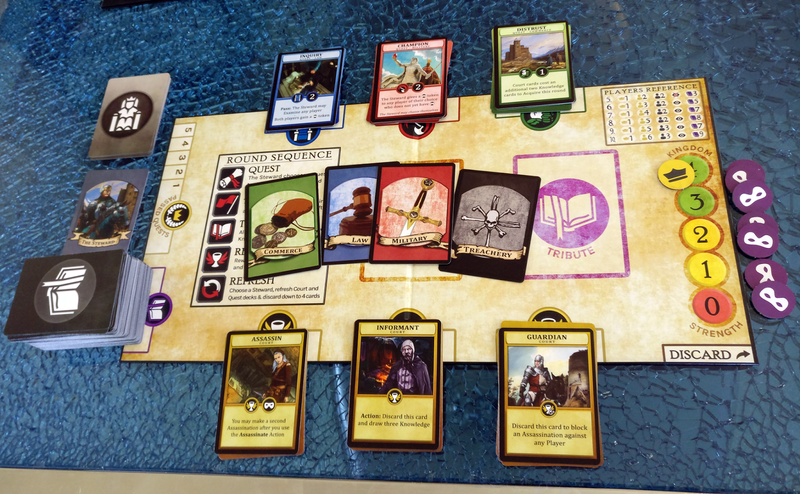 No doubt that balance improves a game, making for a better set of choices and fairness. A well balanced game will always be more engaging than a game which is broken in terms of balance. No doubt that QoL (Quality of Life) improvements and polish serve to make a better game. A game that has been thoroughly polished with all the performance enhancements, options and bells & whistles will always be better than one without. All of these improve how great a game is. No doubt - but none of these change what the game fundamentally is. What we are specifically addressing in this article, is "Why" games are fun. This helps to give us direction, in terms of mechanically and fundamentally altering the game. Every game can improve their graphics or art, their balance, and their polish. We want to transcend that, at least at the moment, because it doesn't pertain to the topic of this article. We are specifically addressing the why different games are fun, and not how to improve on a game. I will cover art, balance, and polish in a later articles of The Dominant Strategy. Is it important to maximize as many of these nodes as possible? The short answer is: No. Simply put, we want to maximize the "fun" of the game while staying True to your design goals. The Nodes tell us where the fun is coming from, not how to make the game more fun. Maximum fun might mean focusing on only one, two or three nodes and maxing them out as much as possible - it pays to remember that some of the nodes conflict and you likely have scarcity of resources. Trying to focus a few core nodes is likely better than trying to hit all of them. The long answer: It really depends what you're trying to do. Hitting as many nodes as possible can be used to try and squeak in some extra fun into a game and to appeal to a larger player base. It depends what your goal is - making the best game possible, or appealing to as many people as possible. Some of the very early games had very narrow focus when it came to the nodes. Take Pong. It was strictly a game of competition, with virtually no other Nodes of enjoyment. Mario Brothers was also quite narrow. It offered very little in terms of story, creativity, etc. It did offer some discovery, and some competition. In the early days, lots of games only focused on one or two nodes. This was done because there was a lack of resources to commit to the game. larger scale games actually have enough content to hit more nodes. I don't think games with a progressing story was a common thing until sometime around NES or super NES. Now we have games like Warframe. They offer Story though most of it is optional and easy to skip, Creativity in terms of character customization and loadout, Plenty of progress in terms of things to unlock. Quite a lot to discover in terms of content, mission types, etc. There is PvP, as well as PvE, and so there is both Competition and a degree of Mastery. There isn't a lot of problem solving, but there can be some in terms of using loadouts to beat missions. There is also a lot of social interaction if you choose to play online with your mates or join up to a clan. Fortnite is also a similar example of a modern game that hits a lot of nodes. The trend of modern games has been to blend together a lot of the aspects of various different genres of games to create a hybrid of sorts - they basically hit as many nodes as possible by doing this. Now this can make for a fun game. The issue is that they can end up being a jack of all trades, master of none. These games are trying to make themselves more fun by appealing to a greater variety of things people enjoy. Oh, you like unlocking things? Enjoy these loot crates. Oh you like leveling up? Here's 20 perks you can unlock, etc, etc. I'm not saying you can't make a fun game like that - clearly you can. What I am saying is that it might not be the "best" approach. Time is better spent taking the funnest parts of your game, and clearing every last possible thing that gets in the way of you enjoying that node. This is a very different approach to trying to hit every single node. Think about when you want to play a game, you're usually looking to tap into one or two of the Nodes. I wanna play something with a sweet story. I wanna have an intense PvP match. I want to do some creative gaming and build a cool base. Rarely do players have the urge to satisfy all their Nodes at once - so why do developers make games that try to do that? Ultimately some of these modern games are trying to tap into as many nodes as possible to make their game more fun, instead of focusing on perfecting the most important nodes needed to actually maximize the enjoyment of the game. Thank you for reading. I was planning on going through some examples, but this article has already stretched out to a massive 3,200+ words, and has taken me WAY to long to type up, think through, and check. I'll be covering some applications of this theory in later articles of The Dominant Strategy. Next time I’ll look at PUBG as a case study and we’ll be examining why it is so popular, what Nodes it taps into, and some general game theory. It's been a while. A lot to cover off since the last update. For a start I've been in hospital with a collapsed lung (spontaneous pneumothorax) - just felt a spike of pain and shortness of breath on my way into work a few weeks ago. It was kinda scary at the time. Spent roughly 5 days split over two visits getting it sorted. There was also the strong possibility that I would need surgery, but after further review this is not happening (phew!). 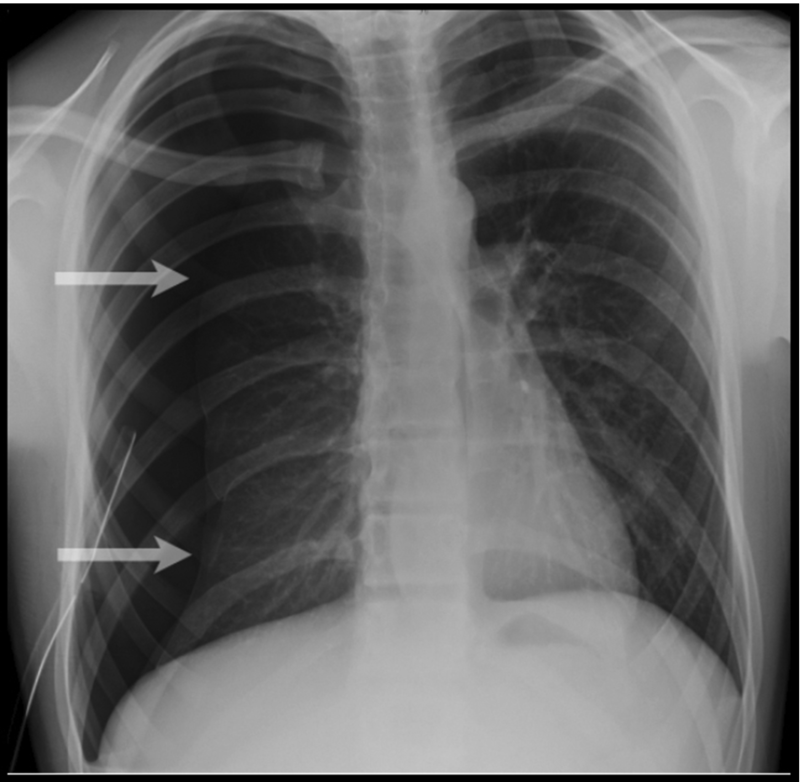 x-ray of a collapsed lung! 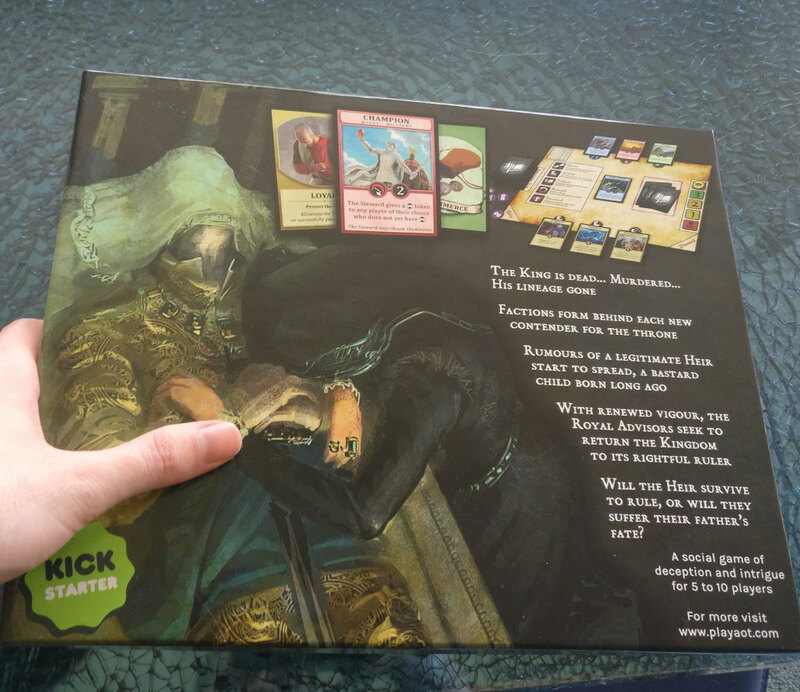 The final prototype has arrived and it's looking glorious! I've been prepping the game for blind playtesting - I have a group all set and ready to go. A prototype is on rout to them as we speak. I'm very much looking forward to hearing how they get on. I'm looking into getting more blind playtests set up too. As much as I'd love to jump into third party reviews, I need to make sure all the blind playtests go smoothly. There was a great update that I put through on the website recently as well. It was mostly quality of life stuff, and should hopefully get more people pointed through to either the email forum or the twitter page. 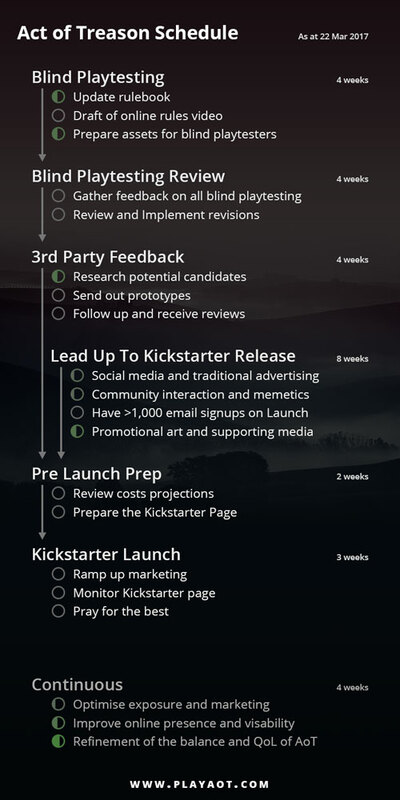 Which was a major goal of the update - trying to land more conversions to the Kickstarter hype lists buy improving the user experience and clarity of message for the 'purchase' page. The Email list and Twitter page will be the core ways I'll be tracking 'hype'. Not that the other social media isn't important! It's just negligible at this stage in comparison to the others. 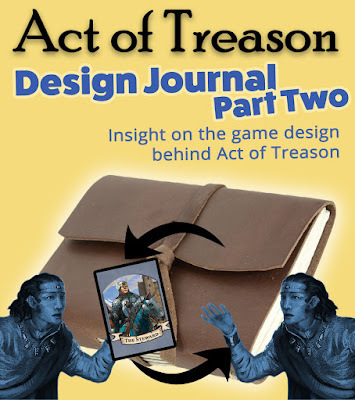 My main efforts right now are getting the word out and marketing - Blind playtests and 3rd party playtests are a bit of a "set it and forget it" kind of deal, but I'm actively tracking tracking the ones I have ongoing. Honestly, my traditional advertising has been working the best so far it seems, but that's mostly due to me not being a "Social Media" kind of dude. It just doesn't come naturally to me (heck it barely comes along as a learned behaviour). I'll also research around to see what's my best approach for advertising - It's one of those things that I've researched in the past, but since it's not my forte I'm in definite need of a refresher - stonemaiergames.com actually seems like an amazing avenue for this. The guy behind it seems like a bit of a genius when it comes to marketing and running a successful Kickstarter. I'll definitely be spending some time this weekend going through their countless articles and using the insights to fine tune my approach. 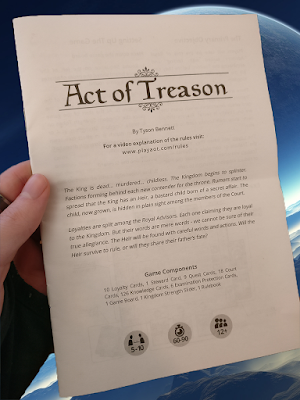 Oh, and I almost forgot - A very cool update is that I've put more rules for public consumption on the official Act of Treason page! Feel free to check them out and stay updated on our social media so you can see when I publish the next batch of rules.